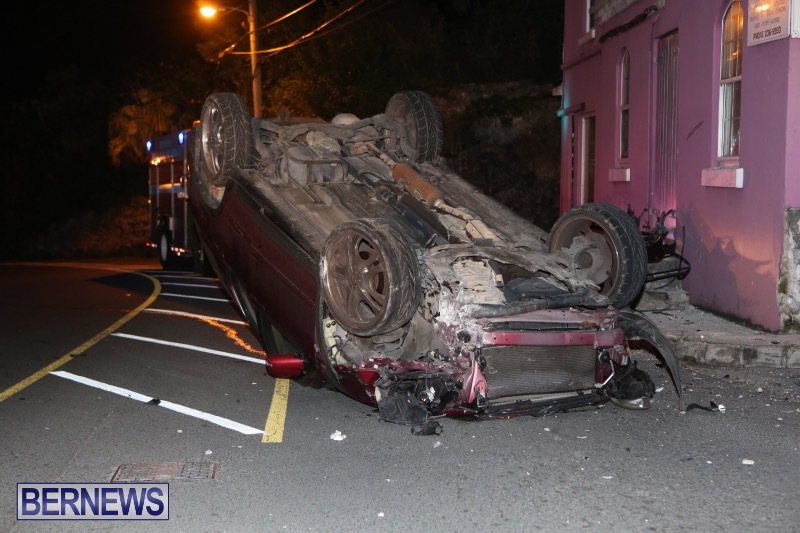 [Updated with video] In the very early hours of this morning [Nov 1] a collision occurred on Middle Road in Devonshire near the junction with Tee Street which resulted in the car overturning. 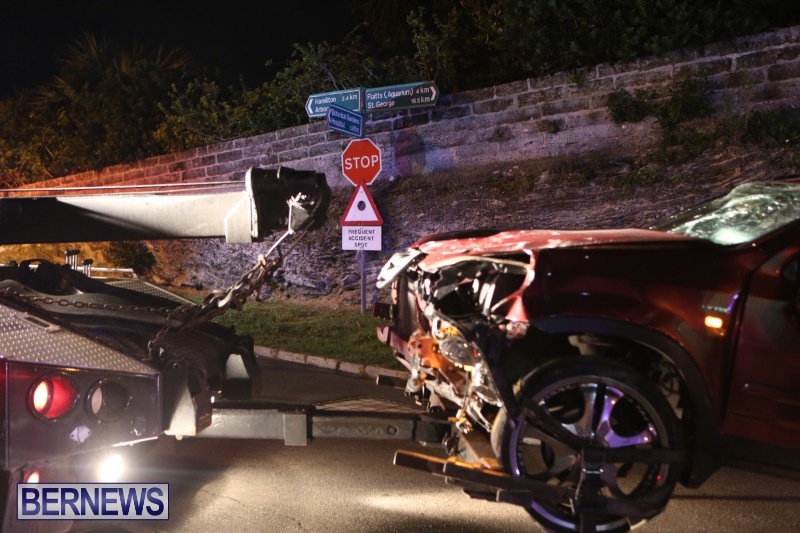 Police, fire and ambulance personnel attended the scene, however unofficial reports suggest that the driver was not seriously injured. We will update with official information as able. hit a low flying witch on her broomstick! Yes, looks like some low flying was involved. 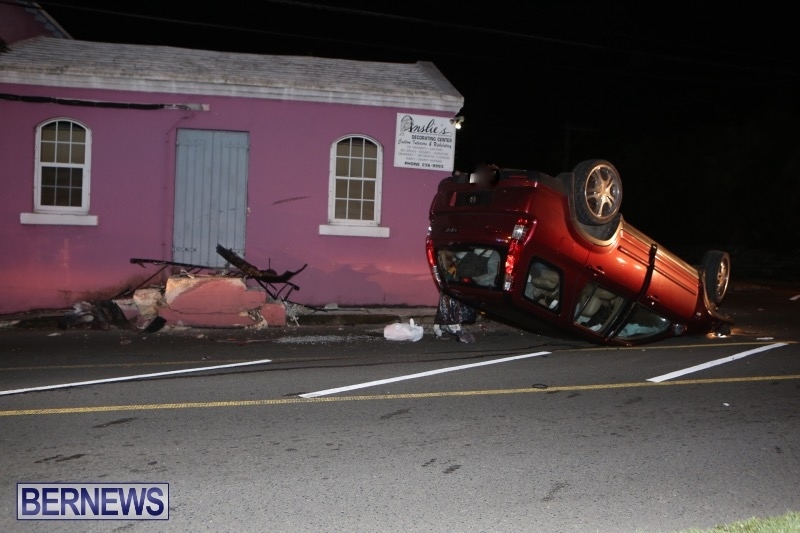 Accidents like this should not be happening so frequently in little Bermuda. Speed, carelessness or more than a few intoxicants will do it every time. Just pure luck an innocent road user wasn’t badly hurt. What do you mean ‘Accidents like this should not be happening so frequently in little Bermuda ‘ ? Irrespective of our tiny size we unquestionably have more out of control drivers per square mile than most other places on earth . I’m surprised it doesn’t happen multiple times a day . I dread going for a ride anywhere and have for a long time . We also have some of the worst drivers I have ever seen…no regard for any of the rules on the road. The sign says frequent accident spot so it’s to be expected. Its time for traffic lights at that junction – although that won’t help if a careless drive is involved ! Let me guess…the umpires car….correct? 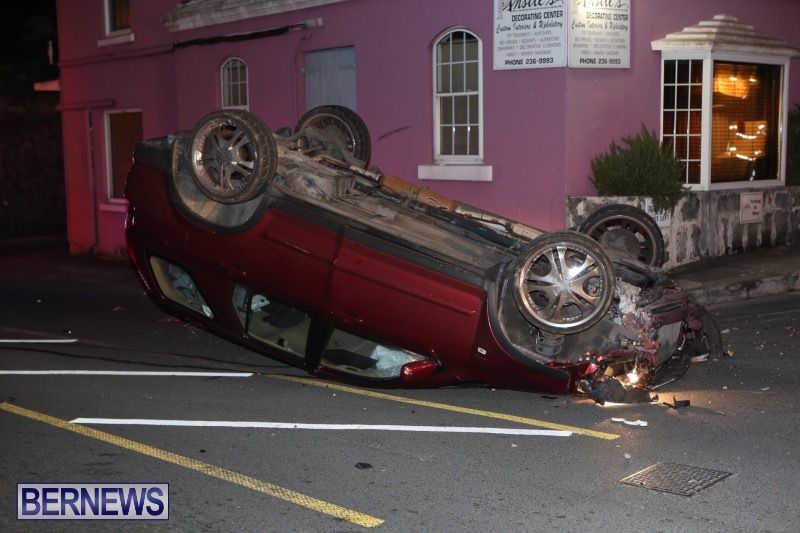 Fortunate driver and passengers not seriously injuries..please .slow down Bermuda…..
Another alcohol, careless driving/speeding or drug related event?? Wow! What if the person wasn’t speeding, alcohol wasn’t involved, and the person could’ve fallen asleep, misjudged the corner. Be for real what else could’ve gone wrong here. Always negative n alcohol involved. I don’t have a clue myself, but think of all possibilities before commenting! Clearly a frequent accident spot! Ah yes. The all- encompassing “I fell asleep” or “I had an overcoming” excuse. Of course. That must have been what happened. that’s a junction where, no matter what over the last 50 years, is continually a frequent accident spot. time for traffic lights? Why? This wasn’t a collision. It was a single- idiot-accident. What about a blown tire or brake failure or a medical condition . Why do we always think so cynical. I can’t believe all the careless and stupid comments this accident elicited. This has been a “frequent accident spot” for as long as I can remember. Instead of blaming the driver, why in the world can’t a traffic light be put there? Is it virtually impossible for anything on the island to be done proactively? 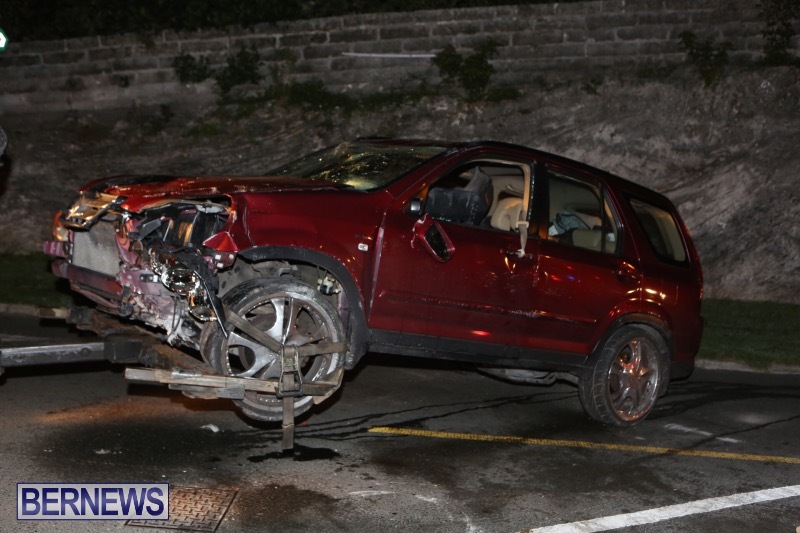 He hit the wall and flipped that car before he even reached the “frequent accident spot”. But that’s OK, he probably ‘just fell asleep’ so that justifies everything in Bermuda. It’s always somebody else’s fault. Never any personal responsibility. He could have pro actively avoided driving like a maniac. Just a thought. Usually when someone is coming off of Tee a Street & turning onto Middle Road. 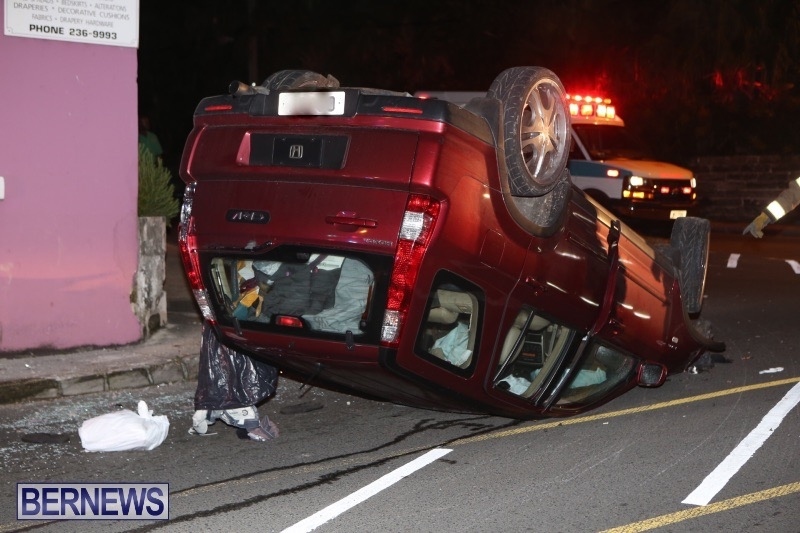 Judging from the state of Ainslie’s steps the SUV must have been traveling west on Middle Road & struck the steps to overturn! I would say speed had something to do with that & for a change not the junction. Just one look at the tires on this vehicle and how nice it did look is the answer. Another of these dangerous walls in the wrong place. Government should take all these walls down and then accidents like this wouldn’t happen. The wall is innocent. It did not jump out and hit the car/suv. The person driving the car/suv hit the wall. Take the driver off the road and have some sympathy for the wall. The only person who will comfort that innocent wall will be Dr. Mason. Glad no one innocent was hurt.